Construction from natural materials is becoming increasingly popular today. Eco-friendly houses, as a rule, are erected from wood, they are also called frame houses, since their construction is carried out in the form of a strong and reliable framework from a wooden pre-treated board. The result is a durable and warm structure, for the decoration of which you can use any facade material. 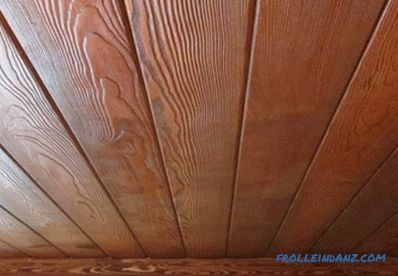 You can sheathe it with the same boards, giving an unusual, but very attractive appearance. The house of the boards can be built independently, the technology of work is not very complicated, but it requires attention . Today you can find a variety of projects and drawings of such houses, many experts offer ready-made or customized solutions. The frame house is considered to be a warm and reliable structure, the facade of which can be sheathed with any available finishing materials. 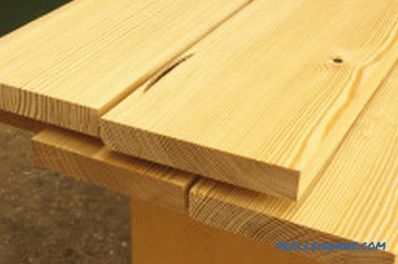 The most suitable material for the construction of frame houses are pine boards. Boards of selected wood species. The best way to build a house is to use a pine tree, it has all the necessary qualities, it is easily processed. Tools for working wood: saw, electric jigsaw, screwdriver, hammer, wooden corner, metal ruler, tape measure, carpenter's pencil. Fasteners in the form of screws, galvanized nails, metal corners, special studded plates for connecting individual elements. The foundation will require a concrete solution, sand, gravel, formwork boards, building level, level (highly desirable). 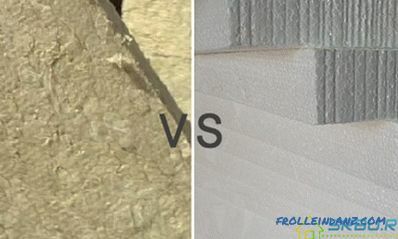 For warming a frame house, it is best to use mineral wool, windscreen, hydro protection in the form of polymer membranes. 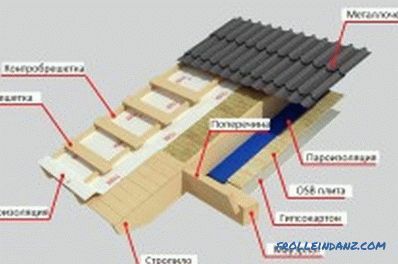 It is recommended to select a roof covering for a wooden house in advance. You can buy a metal tile or shingles. In the latter case, a plywood plate is used as a batten. OSB is great for wall stitching, it is attached to the frame with self-tapping screws. Strip foundation for a frame house. To make a home strong, you need a solid foundation. In this capacity is the foundation. It is a reinforced concrete strip that runs along the perimeter of the entire building and under the main walls. First, the site is marked on the perimeter of the future building, the top layer of soil is removed. After that, a trench is dug to the required estimated depth. As a rule, for a frame house there is enough depth to 60-90 cm and width up to 40 cm. A layer of sand and gravel is poured at the bottom, then they are compacted. 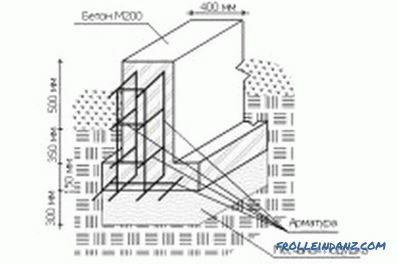 The formwork is made from a regular edging board, which is firmly bonded to each other. There should be no cracks, as the solution will begin to flow through them. After the formwork is ready, it is necessary to make 2 reinforcement belts using special rods, they are tied with a binding wire. Filling is carried out at one time; this process should not be stretched for several days. After pouring, the concrete is pierced with a metal bar or treated with a vibropress to remove all air bubbles from the mass. After pouring, the foundation is left for 28 days for complete drying. 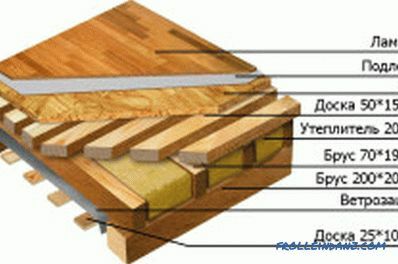 To build the frame of a wooden house you need only from dry boards without any defects. 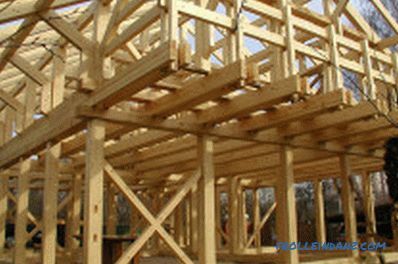 Building a house from boards begins with the installation of a frame. The board for this must be dry and free from serious defects. The section of the board for work should be 150x50 mm - this is the optimal size. Today, such boards can be ordered not only from the supplier, but also together with the project of the future home. In this case, a detailed scheme is given for the construction of the building, it only remains to follow it exactly. This greatly facilitates and accelerates the work, makes them better and more reliable. 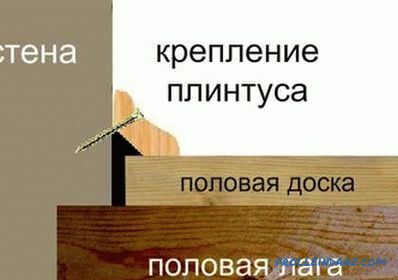 The first to construct frames for external walls and internal partitions, for which the thorn-groove connection, anchors and self-tapping screws are used. Additionally, all joints are recommended to be fixed with the help of angles and studded plates. It is important to ensure that the design is not loose, but durable and reliable. Vertical racks are mounted with a pitch of 600 mm, it is necessary to use braces, which reinforce the design. Immediately required to provide for the presence of window and door openings, which are framed by boards around the perimeter, further strengthened. Floor installation scheme in the frame house. The construction process continues, then you must perform work on the floor. First, it is necessary to lay a timber of 150x50 mm around the perimeter. Before the foundation, a layer of bitumen and roofing material are applied in 2 layers to create an excellent waterproofing. The boards themselves are treated with special antiseptic compounds. Such primary plating is fastened with anchors, they are installed in 2-meter increments. All angles are set exactly what the building level is used for. A maximum skew of 10 mm is allowed. After the base is ready, it is necessary to start laying the rough house of the boards, they are mounted tightly to each other. On such a rough floor lay logs in the form of wooden bars, between them is laid insulation. In this case, it is recommended to take bulk materials, which are suitable for expanded clay, ecowool, sawdust. The last stage is the flooring of finishing wooden boards, on which any floor covering is already laid. Instead of boards you can use waterproof plywood shields. Layout of external walls in a frame house. The construction of the walls consists of the fact that the frames are assembled on a flat surface, after which they are raised and fixed at the required place. It is important to collect them on a flat surface, otherwise they may turn out to be skewed. When building walls, you must clearly follow the project, to comply with all sizes. The first set of rectangular frames, after which the beams are mounted in increments of 300, 400, 600 mm. Dimensions are selected based on the fact that all loads will be distributed correctly. With a pitch of 600 mm, it will be easy to lay mineral wool as a heater. After the erection of the frame is completed, the frames are fastened one by one with metal plates, self-tapping screws and anchors. Such fixture turns out reliable and strong. When construction is finished, it is necessary to start wall-covering. Before this, it is recommended to carry out in advance all communications that are easily hidden in the cavity of the walls. Holes for electrical cables, plumbing and heating pipes, sewage systems are cut in the framework boards. This will allow you to perform hidden installation of communications, but the pipes for it use metal-plastic, which are great for installation. Next, the outer side of all the walls of the house is sewn, and the insulation works are performed. 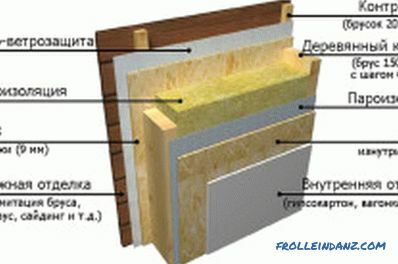 For internal surfaces of walls can be applied, as well as for external, OSB. After sewing, drywall is used, it is an excellent basis for decorative interior decoration. Scheme of the device window in the frame house. An important step is the installation of windows. 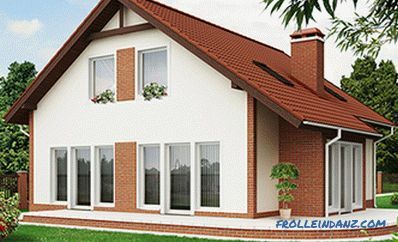 According to the norms, the area of ​​windows for one wall should not be less than 18%. You can make them more, often used so-called panoramic windows. It all depends on what kind of house is planned. 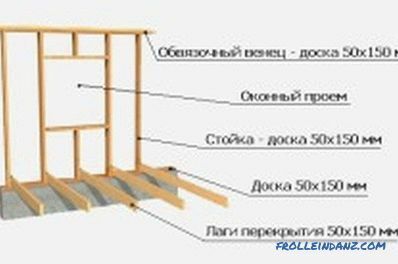 If the construction of a seasonal dacha is in progress, then the frames can be taken as usual, but for permanent residence, preference should be given to high-quality insulating glass units, which will perfectly protect against any bad weather and frost. Glazing is done after the openings under the windows are ready. Metal-plastic frames will be a relatively inexpensive option, but you can also use wooden frames, the cost of which can be much higher. When installing structures, it is necessary to thoroughly seal all gaps with assembly foam; tow or pieces of mineral wool are often required to provide excellent protection. Layout of the roof frame house. The construction of the house ends with the construction of the roof. For a wooden house is well suited metal tile, which is easy to fit and has an attractive appearance. Fit and shingles soft, which is also easy to install and has an unusual and original appearance. The construction of the roof begins with its design. It all depends on what size and shape the building has. Most often, an independent gable roof is used for an independent structure, which is relatively uncomplicated in execution and is suitable for any structure. For a gable roof, the attic can be easily converted into an attic. from the side of the interior, vapor barrier is laid, layer OSB. The first is mounted truss system. Next, work begins on fastening crossbars, laying a layer of insulation and waterproofing.The roofing material is mounted last, the installation technology depends on what kind of coating is chosen for work. Building a house from wooden boards is a simple process if you strictly follow the technology. Such a structure is a frame construction, the external walls and partitions are erected first, after which the work on the device of the floors, the covering of the internal walls and the roof is performed. 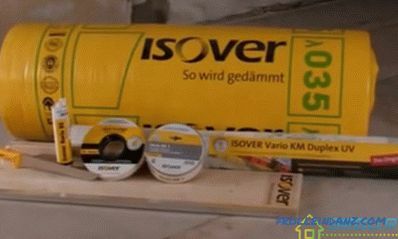 As a foundation, it is best to use a lightweight tape, which is ideal for any frame house.